This month I’ve found several ways to save on an electric Sonicare toothbrush. I found over 18 coupons from Amazon and 1 manufacture coupon, I also found three new rebate forms from Kohl’s , Bed Bath & Beyond and a manufactures rebate form. Full details can be found below. First up I used the Bargain Bin Betty Coupon Database to search for any new coupons listed online. It only displayed one new coupon which was a printable one from the company promotions page. This database will display any new coupons posted in grocery flyers from most online retailers. Two places it doesn’t display coupons for is Costco and Amazon. So I headed over to Costco and Amazon to see if they had any new coupons available. Costco didn’t have anything this month but Amazon has 18 new coupons for January available on their website. This includes savings from $5 off to up to $30 off various models of their electric toothbrushes. To redeem these coupons simply clip the coupon and it will be added to your cart when you check out. Next up I started looking for any new Sonicare Rebates for January. The first one I found was from Bed Bath & Beyond and will get you a Visa Prepaid Gift Card from $5 to $50 depending on the model of electric toothbrush you want. See the picture below for details on the rebate. You must send out the rebate by Feb 3rd 2019. And you can print off the form from the link above. Next up Kohl’s has a rebate currently available that will get you a $25 Visa Prepaid Gift Card off various models. This is worth a look but make sure you compare the rebate with the one being offered from Bed Bath & Beyond above. 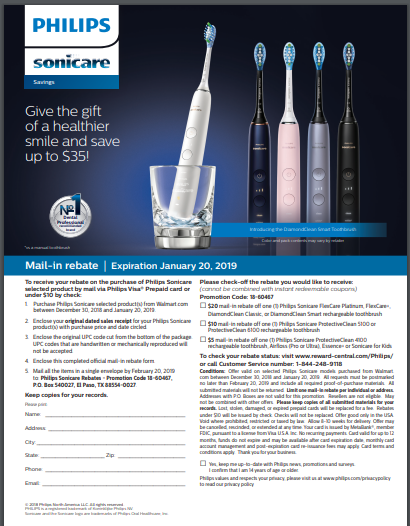 I also found a Sonicare Mail in rebate that will save you up to $35 off and is valid until January 20th 2019. 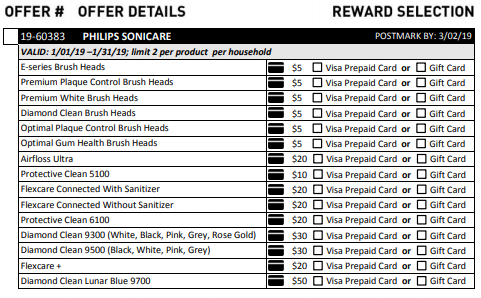 Just print off this Sonicare Rebate Form and send it in to the address listed on the form. That’s it for January, I’ll keep looking for more deals and will post them as I find them. If you’ve found any other deals I’ve missed please make sure you share them on our Facebook page. This entry was posted in Philips Sonicare Coupons, Sonicare Rebate Forms and tagged 2019, Janaury, printable, Rebate Form, Sonicare coupon, sonicare rebate. ← Save Over $30 Off A Sonicare – Just In Time For Christmas!